What do I do If my Tooth Hurts? Life can be busy, and nothing can cause it to come to a halt faster than something causing us pain. Tooth pain can be a miserable condition. There are many different reasons why a tooth may be causing discomfort and some reasons may require immediate medical attention and some reasons may not. Determining the reason can help you decide your next step. There are symptoms and indications that you can look for that can help you determine why your tooth is hurting. • Did an impact injury precede the pain? Was a tooth jarred, now possibly feeling loosened? If this is the case, with no additional symptoms, leave your tooth alone, time will allow it to reattach firmly into position. If it does not seem to be tightening back up, then contact your dentist. • If an impact injury caused the tooth to fracture or break, contact our dentist office. If your tooth was weakened due to fracture, the placement of a dental crown may be necessary to save the tooth structure. • Is there food stuck between your teeth? 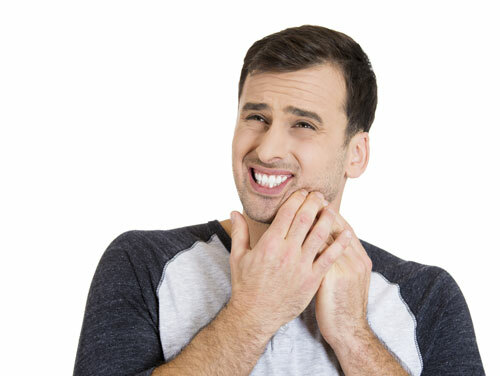 Food stuck between your teeth can cause your gums to feel irritated, causing discomfort. Sometimes brushing or flossing, even if it's not during your normal routine brushing time, may relieve tooth pain. Food particles stuck in nooks and crannies can cause discomfort. • Are your teeth feeling sensitive to hot and cold? This can be an indication of a couple of different problems. Sensitivity could be an indication of your hard layer of enamel being thin in spots, exposing the dentin below, which is sensitive. We can help rebuild and strengthen your enamel. Another possibility for sensitivity can be the presence of a cavity. Once a cavity has extended through the enamel, once again, your underlayer of dentin is exposed and reacts to hot and cold with sensitivity. This may be an indication of needing restoration work including a root canal. Please contact us if your experiencing tooth pain.